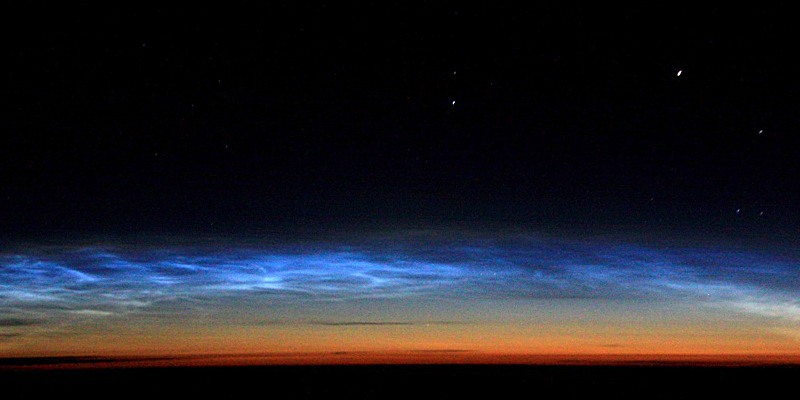 Data from NASA's AIM spacecraft show that noctilucent clouds (NLCs) are like a great "geophysical light bulb". They turn on every year in late spring, reaching almost full intensity over a period of no more than 5 to 10 days--and the bulb is glowing. "They were visible to the north for about 3 hours as we flew between Ottawa and Newfoundland at 35,000 feet" said Brian Whittaker. These electric-blue ice clouds hang 53 miles (85 km) above Earth's surface, at the edge of space itself, circling the north and south pole regions. AIM has helped clarify the mystery of how they form, including information on the required temperatures and water vapor necessary in the atmosphere. Observing tips: NLCs favor high latitudes during the summer months, although they have been sighted as far south as Colorado and Virginia. Look west 30 to 60 minutes after sunset when the Sun has dipped 6-16 degrees below the horizon. If you see luminous blue-white tendrils spreading across the sky, you may have spotted a noctilucent cloud.